Do I know music theory? Answer is I don’t know. In this world there is an examination or certification process for everything you learn so I have to pass an exam just to prove that I do know music theory. That’s $2,400 for 16 x 1.5 hours lessons. Knowing it is one thing but passing an exam and prove that you have acquired the knowledge is another matter. Never mind I determined to learn seriously this time. By the way there are more drop offs in my group in the last lesson there were only 2 out of total 7 originally. I have never used bluebooth mouse before. It’s particularly good if you feel 2 USB ports aren’t enough and you didn’t bring a hub with you. Bluetooth requires no dongle and most notebook will support it. I’m very pleased with the touchpad on my new MBP especially the gestures using multiple fingers. Well once in a while a mouse is better. My son’s cello isn’t expensive I bought it through his school for $1,700. The A string was about to break so I was looking for replacements strings. Checked a few places new strings for 1/4 size aren’t easy to find. 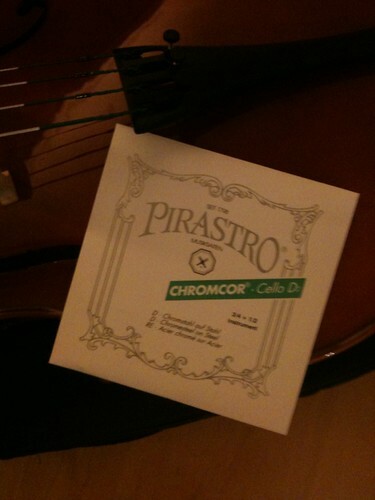 At last I bought below which is for 1/2 to 3/4 size and surprisingly it’s longer than the original strings by only 35mm. This is sort of like ink cartridge for printer. Costs of a few sets would exceed the cost of the equipment/instrument. With this and a cello stand for $180 will add to my investment on cello. The application that came with original dongle didn’t work, googled for a solution, downloaded latest driver and followed steps in here. It worked like a chime. However making a connection could be difficult at times.